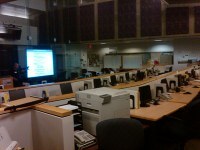 Albuquerque's EOC is organized on the guidelines of the U.S. Department of Homeland Security as outlined in the National Incident Management System (NIMS). This ensures maximum operational effectiveness between all levels of government. So, if the type and severity of the incident calls for it, Operations will include Police and other Law Enforcement, Fire, Rescue, Hazardous Materials, Public Health, Energy, and Communications. Other divisions may be involved as well. If a disaster occurs, the EOC Situation Analysis Team (SAT) will evaluate and decide which divisions need to be activated to best support the incident. Mark Reynolds will be our Tour Guide at this facility. Mark Reynolds, Associate Director of UNM Information Technologies, and Manager of Core IT Services: IT Networks. Mark has over 40 years of telecommunications service, 30 years of which are in higher education. Attendees to this tour will see agents taking calls, routing them, etc. – this is the latest greatest technologies for 911 calls. Also Fire and Emergency has a center in the same building right next door – so we will have the same visit with them. Head westbound on I-40 to 98th street exit and exit the freeway preparing to turn left. Turn left on 98th streetand go south to Central and turn right (west) on to Central. You will pass signs which say “leaving the City of Albuquerque”. Go about 3/4 of a mile to 114th street and turn left (south) on to 114th street. Go about a block and turn right onto Sunset Gardens and take almost an immediate left just past the solar panel parking lot. Follow the road past the Fire academy to the fenced areas to the guard shack and buzz letting them know you're there to see me and they'll open the gate. Park anywhere and I will come down to meet you. My cell is 379-7558 if you have any problems!